I was out doing a little street photography and trying some new things when I spotted this father and daughter. They were having such a wonderful time and enjoying each other’s company. I really like their expression and how her face was reflected in his sunglasses. I wanted my photo to be totally about the moment so I zoomed into their faces as close as I could. I added a frame to make the photo look more like a snapshot. Camera settings: Nikon D3, Nikon 70-210mm f/2.8 with 1.7x teleconverter at 340mm shot at ISO 200, f/5.6 and 1/500th of a second. Lightroom—Set white and black points. Photoshop—used onOne Photoframe to add frame. NIce moment. You can see the feelings in the little gils expression. Why are you showing me a snapshot? Good job capturing a really nice moment! Love the reflection in the sunglasses! This photo is totally about expression and moment. You got both right. I do wish that her shirt was not so color. It tends to take some of the attention from their faces. A snapshot captures a point in time, devoid of emotion or any redeeming value as a photograph. It records an unprocessed view that the camera is pointed at, with the intent of saying I was here, period. While this photo has been framed to "look" like a snapshot, in reality it represents a photograph. A photograph captures a moment in time, evokes or captures emotion, is well composed and sets the subject apart from the rest of the scene, among other qualities. 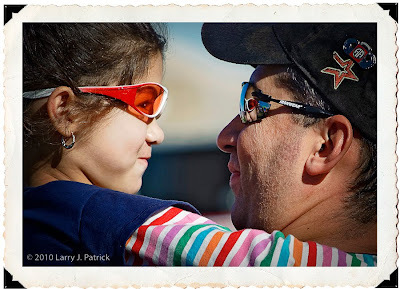 From the smiles on their faces and limited DOF to the reflection of the little girl in her dad's sunglasses; this is a photograph. It is a photograph within a snapshot style frame, which I believe is what you were trying to accomplish. Well done. It is truly more than "just a snapshot". Great example of street photography. I agree with Doug. This is more than a snapshot. You nailed the emotions of two people in a tender moment. Personally, I wished you had not put the frame around it. I do not know the difference between a photo and a snapshot. I do feel that this image captures a tender moment between a father and daughter. I like it. I take it that this is different than the street photography and street portraits that you described in an earlier post. Personally, I like this more because there is a feeling about this one that the other one did not have. Enjoy your photos of people. Do you think about the things you write about before you take the photo or is it something that you feel subconsciously? It seems you get your people shots at just the right second. I always seem to be a second or two late on mine. So many of your people photos have great expressions in them. How do you get those expressions? I rarely get a moment like this.